Wake up your taste buds with COFFEE CRISP's perfect blend of crispy wafer, coffee crème centre and thin chocolatey coating. crème, and layers of light crispy wafers. Now MINI. Made with 100% Sustainably Sourced Cocoa, natural colours and flavours, and is a uniquely Canadian treat. The classic blend of crispy wafer with subtle coffee aroma boosted by a hit of caramel and a dash of salt covered in a thin chocolatey coating. Try one today! Learn about our commitment to sustainable cocoa farming practices. 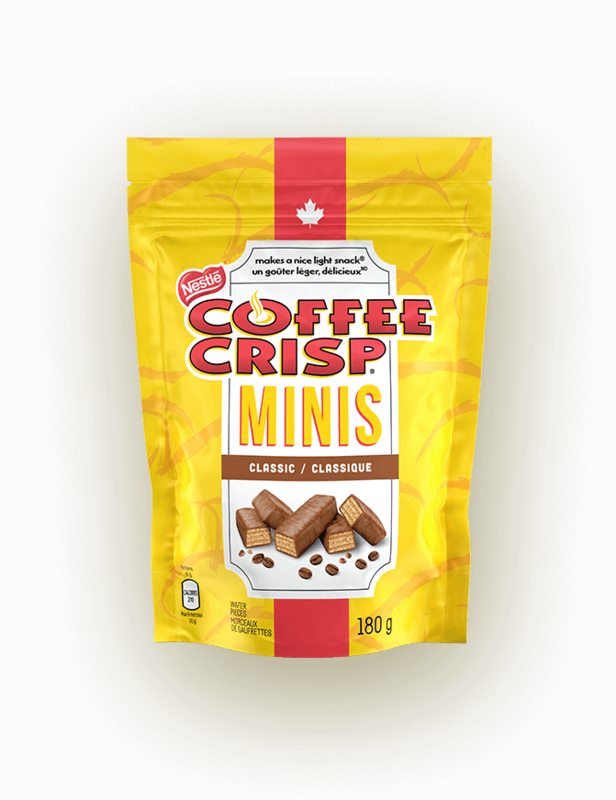 COFFEE CRISP made in Canada has been made with natural flavours since 2011! 100% of landfill waste at our chocolate factory in Toronto is diverted to an electrical co-generation plant. We've proudly supported Kids Help Phone for over 25 years! COFFEE CRISP is a uniquely Canadian treat!